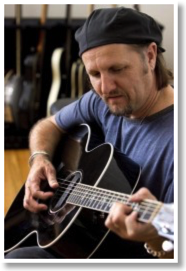 Singer, songwriter and folk musician Jimmy LaFave first came up with his own style of music called “red dirt music” after moving to Oklahoma from Austin, Texas. After extensive touring in Europe and America, and getting air play on more then 200 radio stations, LaFave was asked to perform at the Woody Guthrie Folk Festival by Woody’s daughter, Nora Guthrie. In an interview with LaFave, he discusses how the music in his latest album Depending on the Distance is influenced by his surroundings and musical inspirations, Bob Dylan and Woody Guthrie. As a Guthrie enthusiast, LaFave is currently preparing to take on projects involving Guthrie’s original works both known and left untouched as a way of honoring Guthrie’s music. 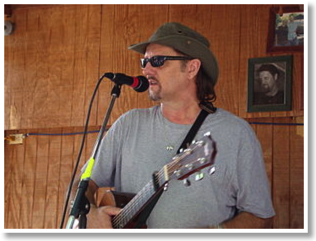 Tell me about what "red dirt music" means to you and how you incorporate that into your songs. The original red dirt sound was quite a bit different than what people call red dirt music now, which is not really my genre of red dirt. The red dirt music now is a little more country and kind of a party music. Some of it is a lot of party music, but the original red dirt stuff I grew up with in Oklahoma was kind of a combination of a little bit of rock and roll, country and folk. In my music today, I would still take a lot of my influences from just some of the musical influences I had, the music I listened to in Oklahoma. On my new record I have that one song called Red Dirt Night where that’s actually a song, I don’t know if you’ve listened to, but those are all towns in Oklahoma. You know, these words I’m spewing out… those are all Oklahoma town names. Can you tell me a little about how various artists have influenced your music? Well, my two biggest influences definitely are Woody Guthrie and Bob Dylan. But of course Dylan would say Woody was his biggest influence. Dylan is just his sense of word play, his poetry and a lot of people underestimate one thing I’ve learned a lot from Dylan is how to sing because you know most people think Dylan can’t sing, and they kind of make fun of his voice, but I think he…knows how to phrase. His phrasing and all is pretty amazing to me, how he phrases different lyrics. That’s something I’ve learned a lot from those guys. From Guthrie I took a lot of just the sense of the rambling and traveling and the power of music to transform people. And I also got a sense of the whole country from his music since he rambled around the USA so much. So it’s kind of been interesting even this centennial year to play at a lot of places he traveled like the Pacific Northwest, New York City, all the places he was. I think he had a good sense of what a huge country we had and all of the diversity and stuff. I like that about his music. How would you say your music has changed from when you first began to how it sounds today? Well, of course, when I was younger I was like most teenagers. I had a lot of loud garage bands. Me, in my older years, I’ve kind of mellowed out a little bit. I think it’s been a little more introspective, of course, and…I’d like to think it has a little more wisdom than maybe some of my earlier songs because…it’s basic human nature. The longer you life, the more you hopefully gain a better understand of yourself. I think it’s changed in that way some. What do you typically try to achieve through your music? I just try to write what comes naturally. A lot of song writing, to me, is not only just writing from your own life experiences, but being a good observer of other things or feeling empathy for other people’s situations. I think it’s funny how a lot of times I’ll have a record and I’ll run into somebody and I’ll start getting a sense that they’re kind of hinting that they think that song was about them. I like to write songs where people can relate to them close enough where they think that was about them or their situation or they said, “That song got me through a bad time in my life,” or something. So hopefully it has enough of that in it to make it worthwhile because it’s a gift to share if you can make people happy with music. What were some of the biggest obstacles you had to cross in order to get to where you are today? There were definitely a lot of obstacles like the ones probably young musicians face coming to Austin today. You’ve got to make a living. A lot of musicians that go in town are also college students. It’s hard to balance a lot of things out. 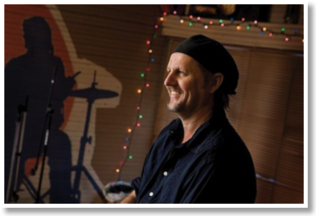 I for many years had just pretty much blue-collar jobs when I played music. I think I was real fortunate that my music career kept growing in increments going upward. I never really totally lost my groove and fell back. Pretty much by the time I hit Austin after a couple of years, I was making a living here just by playing my music at least enough to get by and since then, of course, it’s gotten better and better. Which song did you spend the most time on in your album "Depending on the Distance" and why? It did take time in a way for whatever the songs became to come. I’d be listening to the music driving down the road, for instance, and it might have taken a month, but when the theme finally hit my head and I decided on the first lyrics or the hook line or whatever you want to call it, they all came fairly easy. Probably the hardest one on the record for me to do was one Dylan song called Red River Shore, and it’s nine minutes long so it was a lot of lyrics to remember. Where did you draw most of your inspiration from for this album? A lot of people have been asking me about the title, and “Depending on the Distance” could mean a lot of things but to me it also meant, for instance, you just break up with your girlfriend or boyfriend so it’s a very fresh break up. So you’re kind of mad at the other person or something, but depending on the distance, you might look back at it ten years later and say, “Oh, that was stupid.” You laugh about it. So depending on the distance that you get away from a certain situation, you can totally change your perspective. Do you see your music going in different directions in the future? I don’t think totally. I’m not going to turn into some heavy metal band or anything. I think there’s things that I wanted to do with my music – experiment a little bit – I even put a little bit of strings in a couple of songs of the new record. I don’t think I’ve ever done that on any of my records. Outside of that, I’ll probably just stick to what I do best. Just do my thing. I don’t want to take my fan base through some experimental phase I want to go through with synthesizers or something. I’ve tried to remain true to what I do based on the tradition of songwriters like Woody and Dylan. What advice would you give aspiring artists struggling to break out of their shells? I think everyone has probably something valid to say artistically and it’s really up to the general public at large to figure out if it’s going to make money, but even I knew some really great artists that never made a penny and I loved their work. So I don’t know what to tell somebody except just try to immerse yourself into what you love. If you’re into surfing, get out there and make sure you live near the ocean and get into it. If you’re into music, I’d say just try to listen and motivate towards the stuff that moves you and maybe you’ll find your way and own direction that way. Anything else you would like to tell your fans? Just looking forward to playing some more music this coming New Years and I’m also looking forward to, I mentioned earlier, I have a bunch of Woody Guthrie I have to record. That’s going to be one of my next projects, putting some music to all of these Woody lyrics that have never been heard. That’s next on my plate as far as trying to record. Outside of that, I’m just glad to be doing what I do.